I’m feeling sad this week. Very, very sad. For me, at the moment, all the wonderful matches we have watched this year pale into relative insignificance after hearing of the death of Charlie Stone. It’s a personal thing but one that I want to share with you. In 1969, this London born and brought up lad started his first proper job in Normanton and lived in Pontefract. For reasons too long to go into here my social life centred on Pontefract Rugby Union club. I’d never played rugby. Cricket was my main sport. Nevertheless I was persuaded to play a game for Pontefract. I wanted to give it a go but was actually quite terrified. For a start I could wear my glasses playing cricket but obviously couldn’t on a rugby field so I was about to play a sport I had never played before whilst being severely visually handicapped. They put me in the team at flanker and next to me in the scrum was a young loose forward. Well, young he may have been but he was terrific and what’s more, whilst playing brilliantly he also spent the entire 80 minutes looking after me, telling me, in the kindest manner, what to do and wear to go. That young lad was, of course, Charlie Stone. 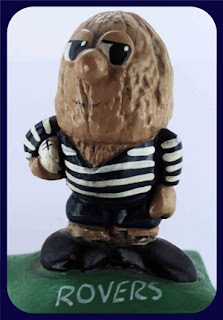 Very shortly after that Charlie signed for Featherstone Rovers and on the 17th October 1970 I went, for the first time, to Post Office Road to watch his first home game which was against Warrington. Fev won 21-16 but for me the result was not that important. I had only watched rugby league on television but watching it live was a thousand times better and I loved the atmosphere in the ground. Now, nearly fifty years later I am a passionate supporter of Fev, going to all home matches and nearly all away ones too. When I retired I devoted myself to documenting every Fev match since 1921 and for four years edited the matchday programme. Fev fills my life and all that is down to Charlie. He ended up playing 242 games for Rovers between 1970 and 1978, becoming one of our greatest players. During that time he was a Challenge Cup winner for Fev and played 33 games in our Championship winning season of 1976/77. He also played for Yorkshire and England. In 1978 he trod the well-known path for our top players of the time from Fev to Hull FC where he played 188 matches including the 1980 Challenge Cup Final against Hull Kingston Rovers and the 1983 Final against Fev. In October 1983 he came back home to Fev playing a further 14 games in the navy and white butcher’s stripe shirt. The following year he came out of retirement and played 28 times for Bradford Northern. Charlie will always have a huge place in my heart and I want to express my heartfelt thanks to him for the way he changed my life by the simple act of signing for Featherstone Rovers. We won’t be at Toulouse this year. We have been twice and thoroughly enjoyed the experience but we have decided to take the trip to Toronto this year and can’t possibly afford to go to Toulouse as well as Toronto. In this week’s Championship Talk Gareth Walker writes about how rugby league should stick by West Wales Raiders and compares their present plight with that of Gateshead Thunder in 2010 when they lost 132-0 to Blackpool Panthers. We think the two cases are very different. Gateshead had already proved that they were capable of attracting decent attendances through their Super League season in 1999 when they had averaged nearly 4,000 spectators at home games. So far, this year, West Wales Raiders have conceded 514 points in 6 matches. That’s an average of about 86 points per game. And that tells us they are playing at a level in which they are not fit to compete. It is one thing to bring into professional leagues well established clubs like Catalans and Toulouse or well-resourced clubs that can attract big crowds like Toronto. It’s an entirely different matter to place a club like West Wales into the professional game. The way clubs are integrated into League One needs a complete re-think. We believe that amateur clubs should prove themselves through the National Conference and only be allowed in to League One when they can prove their viability for the taking their place as a professional club. For different reasons West Wales and Hemel Stags are not currently fit to be in League One and would do far better to try and prove their viability in the amateur sport.